Allspice, also called Jamaica pepper, pepper, myrtle pepper, pimenta, Turkish Yenibahar, English pepper or newspice, is the dried unripe fruit (berries, used as a spice) of Pimenta dioica, a midcanopy tree native to the Greater Antilles, southern Mexico, and Central America, now cultivated in many warm parts of the world. The name ‘allspice’ was coined as early as 1621 by the English, who thought it combined the flavour of cinnamon, nutmeg, and cloves. Several unrelated fragrant shrubs are called “Carolina allspice” (Calycanthus floridus), “Japanese allspice” (Chimonanthus praecox), or “wild allspice” (Lindera benzoin). Allspice is also sometimes used to refer to the herb costmary (Tanacetum balsamita). Allspice is the dried fruit of the P. dioica plant. The fruits are picked when green and unripe and are traditionally dried in the sun. 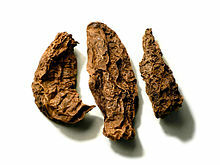 When dry, they are brown and resemble large brown smooth peppercorns. The whole fruits have a longer shelf life than the powdered product and produce a more aromatic product when freshly ground before use. Fresh leaves are used where available. They are similar in texture to bay leaves and are thus infused during cooking and then removed before serving. Unlike bay leaves, they lose much flavor when dried and stored, so do not figure in commerce. The leaves and wood are often used for smoking meats where allspice is a local crop. Allspice can also be found in essential oil form. Allspice is one of the most important ingredients of Caribbean cuisine. It is used in Caribbean jerk seasoning (the wood is used to smoke jerk in Jamaica, although the spice is a good substitute), in moles, and in pickling; it is also an ingredient in commercial sausage preparations and curry powders. Allspice is also indispensable in Middle Eastern cuisine, particularly in the Levant, where it is used to flavor a variety of stews and meat dishes. In Palestinian cuisine, for example, many main dishes call for allspice as the sole spice added for flavouring. In the U.S., it is used mostly in desserts, but it is also responsible for giving Cincinnati-style chili its distinctive aroma and flavor. Allspice is commonly used in Great Britain, and appears in many dishes, including cakes. Even in many countries where allspice is not very popular in the household, as in Germany, it is used in large amounts by commercial sausage makers. It is a main flavor used in barbecue sauces. In the West Indies, an allspice liqueur called “pimento dram” is produced. Allspice has also been used as a deodorant. Volatile oils found in the plant contain eugenol, a weak antimicrobial agent. The allspice tree, classified as an evergreen shrub, can reach 10–18 m (33–59 ft) in height. Allspice can be a small, scrubby tree, quite similar to the bay laurel in size and form. It can also be a tall, canopy tree, sometimes grown to provide shade for coffee trees planted underneath it. It can be grown outdoors in the tropics and subtropics with normal garden soil and watering. Smaller plants can be killed by frost, although larger plants are more tolerant. It adapts well to container culture and can be kept as a houseplant or in a greenhouse. To protect the pimenta trade, the plant was guarded against export from Jamaica. Many attempts at growing the pimenta from seeds were reported, but all failed. At one time, the plant was thought to grow nowhere except in Jamaica, where the plant was readily spread by birds. Experiments were then performed using the constituents of bird droppings; however, these were also totally unsuccessful. Eventually, passage through the avian gut, whether due to the acidity or the elevated temperature, was found to be essential for germinating the seeds. Today, pimenta is spread by birds in Tonga and Hawaii, where it has become naturalized on Kauaʻi and Maui. 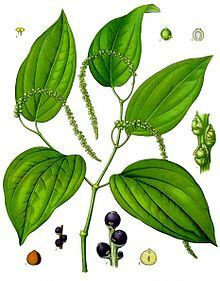 Allspice (P. dioica) was encountered by Christopher Columbus on the island of Jamaica during his second voyage to the New World, and named by Dr. Diego Álvarez Chanca. It was introduced into European and Mediterranean cuisines in the 16th century. It continued to be grown primarily in Jamaica, though a few other Central American countries produced allspice in comparatively small quantities. The Florina pepper (Greek: πιπεριά Φλωρίνης) is a pepper cultivated in the northern Greek region of Western Macedonia and specifically in the wider area of Florina; for which it is named. It has a deep red color, and is shaped like a cow’s horn. Initially the pepper has a green color, ripening into red, after the 15th of August. The red pepper is known in Greece for its rich sweet flavor, used in various Greek dishes and is exported in various canned forms abroad, usually hand-stripped, keeping the natural scents of pepper and topped with extra virgin olive oil, salt and vinegar. The seed was brought to Greece in the 17th century, and cultivated successfully by the locals, as it adapted to the Macedonian climate and soil. The pepper belongs to the capsicum genus of the nightshade family Solanaceae. There are various forms of the capsicum genus which vary in taste, size, shape and color, such as the ‘Grossum’ group (sweet peppers) and the ‘Longum’ group (chilli peppers). The word Capsicum, originated from the Greek word “Kapso”, meaning “to bite”. Florina’s red peppers were awarded the recognition of Protected Designation of Origin in 1994 by the World Trade Organization (WTO). Every year during the last days of August, in a small local village in Aetos, Florina a feast of peppers is held, including celebrations with music bands and cooked recipes, based on peppers which are offered to all the guests. The plant has a height of around 0.50 to 0.75 cm, producing large red sweet peppers by 0.12 to 0.15 cm length and 0.04 to 0,.05 cm width. High productivity and adaptation of the plant can be achieved in efficient draining soils, full sunny locations and low winds for the protection of its branch and root sensitivity. The most convenient temperatures for its growth are between 20° to 26° Celsius during the mid day and 14° to 16° Celsius during the night. Their harvest takes up to 18 weeks, ripening to maturity after mid-August. A good quality, red pepper of Florina should be bright in color, thick, firm and sweet flavored. Its consumption should be avoided with the appearance of dullness, cracks or deterioration, which are factors of the vegetables reduction in quality. The red peppers of Florina are usually roasted and stuffed with different combinations of foods, as rice, meat, shrimps and feta cheese. These sweet peppers are used in sauces, salads, pasta, meat recipes or mashed, creating a pâté with traditional recipes. They can also be dried, canned, frozen and pickled, usually garnishing Greek salads. They can be roasted, sliced and served as an appetizer, by adding olive oil, garlic and sea salt. A well-known traditional recipe in Greece with stuffed peppers is Gemista. The jalapeño (/ˌhæləˈpiːnoʊ/ or /ˌhæləˈpeɪnjoʊ/, Spanish pronunciation: [xalaˈpeɲo] is a medium-sized chili pepper pod type cultivar of the species Capsicum annuum. A mature jalapeño fruit is 5–10 cm (2–4 in) long and hangs down with a round, firm, smooth flesh of 1–1.5 in (25–38 mm) wide. It is of mild to medium piquancy, 1,000 and 20,000 Scoville units in general. It is commonly picked and consumed while still green, but occasionally it is allowed to fully ripen and turn crimson red; and other cultivar variations of the same pod type exist. It is wider and milder than the Serrano pepper. The Chile Pepper Institute is known for developing colored variations. The jalapeño is variously named huachinango, for the ripe red jalapeño, and chile gordo (meaning “fat chili pepper”) in Mexico. The cuaresmeño closely resembles the jalapeño; its seeds have the heat of a jalapeño, but the flesh has a mild flavor close to a green bell pepper. In 1999, roughly 107 thousand acres in Mexico were dedicated towards growing jalapeños and as of 2011, that number had fallen to 101 thousand acres. Jalapeños account for thirty percent of Mexico’s chili production, and while acreage has decreased there has been a 1.5% increase in volume yield per year in Mexico due to increasing irrigation, usage of greenhouses, better equipment, knowledge, and improved techniques so that in 2009 619,000 tons of jalapeños were produced with 42% of the crop coming from Chihuahua, 12.9% from Sinaloa, 6.6% from Jalisco, and 6.3% from Michoacán. La Costeña (food company) controls about 60% of the world market and, according to company published figures, exports 16% of the peppers that Mexico produces, an 80% share of the 20% that Mexico exports in total. The US imports 98% of La Costeña’s exports. According to the USDA, starting since 2010, California produces the most jalapeños followed by New Mexico and Texas, for a total of 462.5 million pounds of peppers (231,250 tons) in 2014. It is difficult to get accurate statistics on chilies and specific chilies as growers are not fond of keeping and sharing such data and reporting agencies often lump all green chilies together, or all hot chilies, with no separation of pod type. In New Mexico in 2002 the crop of jalapeños were worth $3 million at the farm gate and $20 million with processing. China, Peru, Spain, and India are also producers of commercial chilies, including jalapeños. In a 100 gram serving, raw jalapeños provide 29 calories and are an excellent source (> 20% of the Daily Value, DV) of vitamin C, vitamin B6 and vitamin E, with vitamin K in a moderate amount. Protein, dietary fiber, fat and other essential nutrients are low in content. Jalapeños are a low-acid food with a pH of 4.8-6.0 depending on maturity and individual pepper. Improperly canned jalapeños can have botulism and in 1977 home-canned jalapeños led to the largest outbreak of botulism in the US in over a century. If canned or pickled jalapeños appear gassy, mushy, moldy, or have a disagreeable odor, then to avoid botulism, discard the food and boil the jar, lid and contents for 30 minutes in water, scrub all surfaces that may have come in contact with it, and wash all clothing and hands; discarding sponges or towels used in the cleanup in a plastic bag. Canning or packaging in calcium chloride increases the firmness of the peppers and the calcium content, whether or not the peppers are pickled as well as canned. In 2008, fresh jalapeños from Mexico were tested positive for Salmonella leading the FDA to believe that the peppers were responsible for much of the 2008 United States salmonellosis outbreak. This large outbreak of Salmonella led to increased research into the detection of foodborne illnesses on jalapeños, the frequency and behavior of foodborne illness on jalapeños, and ways to prevent foodborne illnesses on fresh jalapeños. Contaminated irrigation water and processing water are the two most common methods that jalapeños become infected, as was the case in the 2008 outbreak. Jalapeños have similar microbial properties to tomatoes, the outer layer of their skin provides a safe environment for foodborne illnesses to survive and if damaged or chopped provides a growth medium pathogens. Washing fresh jalapeños is important to reduce pathogen counts both at the farm and consumer level, but without cold storage it is insufficient to prevent pathogen spread. Jalapeño juice may be used as a remedy for seasonal allergies and clearing sinuses from colds. * Stuffed jalapeños are hollowed out fresh jalapeños (served cooked or raw) that are stuffed, often with a mix containing seafood, red meat, poultry, and/or cheese. * Chipotles are smoked, ripe jalapeños. * Jalapeño jelly, which is a Pepper jelly, can be prepared using jelling methods. * Jalapeño peppers are often muddled and served in mixed drinks. * Jalapeño poppers are an appetizer; jalapeños are stuffed with cheese, usually cheddar or cream cheese, breaded or wrapped in bacon, and cooked. * Armadillo eggs are jalapeños or similar chilis stuffed with cheese, coated in seasoned sausage meat and wrapped in bacon. The “eggs” are then grilled until the bacon starts to crisp. * Chiles toreados are fresh jalapeños that are sauteed in oil until the skin is blistered all over. They are sometimes served with melted cheese on top. * Texas toothpicks are jalapeños and onions shaved into straws, lightly breaded, and deep fried. * Chopped jalapeños are a common ingredient in many salsas and chilis. * Jalapeño slices are commonly served in Vietnamese pho, and are also a common sandwich and even pizza topping in the West. The chili pepper (also chile pepper or chilli pepper, from Nahuatl chīlli is the fruit of plants from the genus Capsicum, members of the nightshade family, Solanaceae. In Britain, Australia, Ireland, New Zealand, South Africa, Pakistan, India, and other Asian countries, the word “pepper” is usually omitted. India is the world’s largest producer, consumer and exporter of chili peppers. Guntur in the South Indian state of Andhra Pradesh produces 30% of all the chilies produced in India. Andhra Pradesh as a whole contributes 75% of India’s chili exports. Though there are only a few commonly used species, there are many cultivars and methods of preparing chili peppers that have different names for culinary use. Green and red bell peppers, for example, are the same cultivar of C. annuum, immature peppers being green. In the same species are the jalapeño, the poblano (which when dried is referred to as ancho), New Mexico (which is also known as chile colorado), serrano, and other cultivars. The substances that give chili peppers their intensity when ingested or applied topically are capsaicin (8-methyl-N-vanillyl-6-nonenamide) and several related chemicals, collectively called capsaicinoids. Capsaicin is also the primary component in pepper spray, a less-than-lethal weapon. When consumed, capsaicinoids bind with pain receptors in the mouth and throat that are responsible for sensing heat. Once activated by the capsaicinoids, these receptors send a message to the brain that the person has consumed something hot. The brain responds to the burning sensation by raising the heart rate, increasing perspiration and release of endorphins. A 2008 study reports that capsaicin alters how the body’s cells use energy produced by hydrolysis of ATP. In the normal hydrolysis the SERCA protein uses this energy to move calcium ions into the sarcoplasmic reticulum. When capsaicin is present, it alters the conformation of the SERCA, and thus reduces the ion movement; as a result the ATP energy (which would have been used to pump the ions) is instead released as thermal energy. The “heat” of chili peppers was historically measured in Scoville heat units (SHU), which is a measure of the dilution of an amount of chili extract added to sugar syrup before its heat becomes undetectable to a panel of tasters; the more it has to be diluted to be undetectable, the more powerful the variety and therefore the higher the rating. The modern commonplace method for quantitative analysis of SHU rating uses high-performance liquid chromatography to directly measure the capsaicinoid content of a chili pepper variety. Pure capsaicin is a hydrophobic, colorless, odorless, and crystalline-to-waxy solid at room temperature, and measures 16,000,000 SHU. time, which may also be done by pickling. The leaves of every species of Capsicum are edible. Though almost all other Solanaceous crops have toxins in their leaves, chili peppers do not. 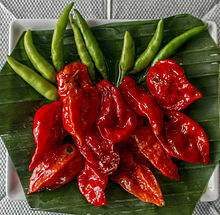 The leaves, which are mildly bitter and nowhere near as hot as the fruit, are cooked as greens in Filipino cuisine, where they are called dahon ng sili (literally “chili leaves”). They are used in the chicken soup tinola. In Korean cuisine, the leaves may be used in kimchi. In Japanese cuisine, the leaves are cooked as greens, and also cooked in tsukudani style for preservation. * Arrabbiata sauce from Italy is a tomato-based sauce for pasta always including dried hot chilies. Puttanesca sauce is tomato-based with olives, capers, anchovy and, sometimes, chilies. * Paprikash from Hungary uses significant amounts of mild, ground, dried chilies, known as paprika, in a braised chicken dish. * Chiles en nogada from the Puebla region of Mexico uses fresh mild chilies stuffed with meat and covered with a creamy nut-thickened sauce. * Curry dishes usually contain fresh or dried chillies. * Kung pao chicken (also spelled gong bao) from the Sichuan region of China uses small hot dried chilies briefly fried in oil to add spice to the oil then used for frying. * Mole poblano from the city of Puebla in Mexico uses several varieties of dried chilies, nuts, spices, and fruits to produce a thick, dark sauce for poultry or other meats. * Nam phrik are traditional Thai chili pastes and sauces, prepared with chopped fresh or dry chilies, and additional ingredients such as fish sauce, lime juice, and herbs, but also fruit, meat or seafood. * ‘Nduja, a more typical example of Italian spicy speciality, from the region of Calabria, is a soft, pork sausage made “hot” by the addition of the locally grown variety of jalapeño chili. * Paprykarz szczeciński is a Polish fish paste with rice, onion, tomato concentrate, vegetable oil, chili pepper powder and other spices. * Sambal belacan (pronounced “blachan”) is a traditional Malay sauce made by frying a mixture of mainly pounded dried chillies and fermented prawn paste. It is customarily served with rice dishes and is especially popular when mixed with crunchy pan-roasted ikan bilis (sun-dried anchovies), when it is known as sambal ikan bilis. * Som tam, a green papaya salad from Thai and Lao cuisine, traditionally has, as a key ingredient, a fistful of chopped fresh hot Thai chili, pounded in a mortar. Capsaicin is considered a safe and effective topical analgesic agent in the management of arthritis pain, herpes zoster-related pain, diabetic neuropathy, mastectomy pain, and headaches. However, a study published in 2010 has linked capsaicin to skin cancer. A 2015 cohort study in China found that eating foods containing chili peppers at least twice a week led to a 10 percent reduced mortality rate all else being equal and eating foods containing chili peppers 6 to 7 days a week had a 14 percent relative risk reduction in total mortality; there was an inverse correlation between eating fresh chilies and diabetes not found in remainder of the cohort. 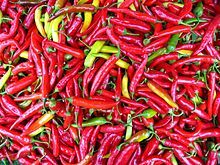 The cayenne pepper, also known as the Guinea spice, cow-horn pepper, red hot chili pepper, aleva, bird pepper, or, especially in its powdered form, red pepper, is a cultivar of Capsicum annuum related to bell peppers, jalapeños, paprika, and others. The Capsicum genus is in the nightshade family (Solanaceae). It is a hot chili pepper used to flavor dishes. It is named for the city of Cayenne in French Guiana. Cayenne is used in cooking spicy dishes, as a powder or in its whole form (such as in Korean, Sichuan, and other Asian cuisine), or in a thin, vinegar-based sauce. It is generally rated at 30,000 to 50,000 Scoville units. It is also used as an herbal supplement, and was mentioned by Nicholas Culpeper in his Complete Herbal, 1653, as “guinea pepper”, a misnomer for “guiana pepper”. Most cultivated varieties of cayenne, Capsicum annuum, can be grown in a variety of locations and need around 100 days to mature. Peppers prefer warm, moist, nutrient-rich soil in a warm climate. The plants grow to about 20–39 in in height and should be spaced 3 ft apart. In gardens, the plants may be planted as close as 1 ft apart in a raised bed. This may reduce the yield of an individual plant, but will increase yields per unit area. Chilis are mostly perennial in subtropical and tropical regions; however, they are usually grown as annuals in temperate climates. They can be overwintered if protected from frost, and require some pruning. Cayenne pepper, by weight, is relatively high in vitamin A. It also contains vitamin B6, vitamin E, vitamin C, riboflavin, potassium, and manganese. However, given the very small amount of cayenne pepper typically consumed in a serving, it makes a negligible contribution to overall dietary intake of these nutrients. Cayenne pepper consumption dilates the blood vessels and speeds the metabolism due to the high amounts of capsaicin. With the consumption of cayenne peppers, the amount of heat the human body puts off is influenced. In animal studies, capsaicin has the ability to boost metabolism, which in turn causes weight loss. This increases circulation and blood flow to all major organs, facilitating oxygen and nutrient delivery. Capsaicin may support a healthy energy balance while suppressing appetite. Capsaicin has been shown to increase energy expenditure, so acts as a metabolism booster and is beneficial in long-term weight loss. A correlation has been shown between substrate oxidation and capsaicin. Capsaicin treatment sustained fat oxidation during weight maintenance, but did not affect weight regain after modest weight loss. Cayenne pepper is also claimed to be an aphrodisiac because it contains capsaicin. It has also been shown to aid in the oxidation of adipose tissue, regulate high blood pressure, promote healthy liver function and tissue production, help regulate the digestive system, and promote healthy mucus production in the membranes that line internal organs. Cayenne is a popular spice in a variety of cuisines. It is employed variously in its fresh form, dried and powdered, and as dried flakes. It is also a key ingredient in a variety of hot sauces, particularly those employing vinegar as a preservative. Cayenne pepper is often spread on sandwiches or similar items to add a spicy flavor. Health hint about Cayenne Peppers…..
Cayenne peppers, as well as other types of pepper and chillies, contain a component or substance by the name of “Capsaicin”. This component is known to have many therapeutic qualities, ranging from lowering cholesterol levels and preventing cardiovascular disease to relieving pain caused by arthritis or rheumatism. Red, yellow and green bell peppers. Bell pepper, also known as sweet pepper or a pepper (in the United Kingdom, Canada and Ireland) and capsicum /ˈkæpsɨkəm/ (in India, Pakistan, Bangladesh, Australia, Singapore and New Zealand), is a cultivar group of the species Capsicum annuum. Cultivars of the plant produce fruits in different colors, including red, yellow, orange, green, chocolate/brown, vanilla/white, and purple. Bell peppers are sometimes grouped with less pungent pepper varieties as “sweet peppers.” Peppers are native to Mexico, Central America and northern South America. The ribs and seeds inside bell peppers may be consumed, but some find the taste to be bitter. Pepper seeds were carried to Spain in 1493 and from there spread to other European, African and Asian countries. Today, China is the world’s largest pepper producer, followed by Mexico and Indonesia. The misleading name “pepper” was given by Christopher Columbus upon bringing the plant back to Europe. 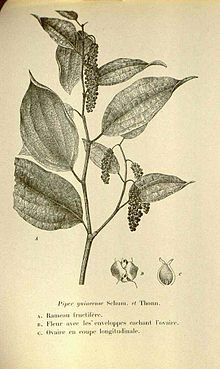 At that time, peppercorns, the fruit of an unrelated plant originating from India, Piper nigrum, was a highly prized condiment; the name “pepper” was at that time applied in Europe to all known spices with a hot and pungent taste and so naturally extended to the newly discovered Capsicum genus. The most commonly used alternative name of the plant family, “chile”, is of Mexican origin, from the Nahuatl word chilli or xilli. Bell peppers are botanically fruits, but are generally considered in culinary contexts to be vegetables. While the bell pepper is a member of the Capsicum genus, it is the only Capsicum that does not produce capsaicin, a lipophilic chemical that can cause a strong burning sensation when it comes in contact with mucous membranes. (An exception to this is the hybrid variety Mexibelle, which does contain a moderate level of capsaicin, and is therefore somewhat hot). The lack of capsaicin in bell peppers is due to a recessive form of a gene that eliminates capsaicin and, consequently, the “hot” taste usually associated with the rest of the Capsicum genus. Most often bell peppers are green, yellow, orange, and red (between stages of ripening). More rarely, color can be brown, white, lavender and dark purple, depending on the variety of pepper. Most typically, unripe fruit are green or, less commonly, pale yellow or purple. Red bell peppers are simply ripened green peppers, although the Permagreen variety maintains its green color even when fully ripe. 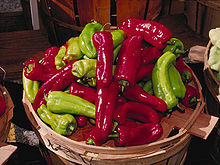 Green peppers are less sweet and slightly more bitter than yellow or orange peppers, with red bell peppers being the sweetest. The taste of ripe peppers can also vary with growing conditions and post-harvest storage treatment; the sweetest fruit are allowed to ripen fully on the plant in full sunshine, while fruit harvested green and after-ripened in storage are less sweet. 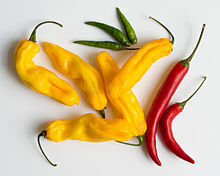 The banana pepper (also known as the yellow wax pepper or banana chili) is a medium-sized member of the chili pepper family that has a mild, tangy taste. While typically bright yellow, it is possible for them to change to green, red, or orange as they ripen. It is often pickled, stuffed or used as a raw ingredient in foods. It is a cultivar of the species Capsicum annuum. Its flavor is not very hot (0–500 Scoville units), and as is the case with most peppers, its hotness depends on the maturity of the pepper, with the most ripe being sweeter than younger ones. A mature fruit will be about 2-3 inches (5–8 cm) in length and have a curved shape and yellowish color similar to a banana, giving rise to the fruit’s common name. Peperoncini are often erroneously referred to as banana peppers and immature Hungarian wax peppers are frequently mistaken for them. It’s not uncommon for Hungarian wax peppers to be sold in bunches of banana peppers providing more heat and less sweetness than would be expected. The plant requires full sun, like other Capsicum annuum varieties, and should be treated the same as most other plants in the pepper family. Plants can be grown from seed and cuttings. The hot varieties of Banana pepper are called Hungarian Wax Peppers. Cultivars include Early Sweet Banana, Hungarian Yellow Wax, Sweet Banana, Sweet Hungarian. A mature plant will reach 1 to 2 feet tall and can be grown in many climates, but prefer warmer climates. Banana peppers are an optimum food for inclusion in weight loss diets, containing low amounts of calories, fat, and sodium. They are also a good source of dietary fiber, vitamin A, potassium and a very good source of vitamin C. The mild heat associated with them makes it ideal for adding to lighter fare such as salads in order to make them feel more filling. * Pickled banana peppers are commonly sold sliced and used to garnish pizzas, sandwiches and Greek salads. * Pickled and stuffed banana peppers are common inclusions on Antipasto bars filled with prosciutto and/or cheese. * Stuffed banana peppers are served warm with a variety of Italian sausage and cheeses. * Chopped or diced banana peppers are used in many relishes and salsas to add sweetness with other peppers providing heat. * Banana peppers may be jellied along with other hot green peppers such as jalapeños. pepper, Ashanti pepper, Benin pepper, false cubeb, Guinea cubeb, uziza pepper or (ambiguously) “Guinea pepper”, and called locally kale, kukauabe, masoro, sasema and soro wisa. 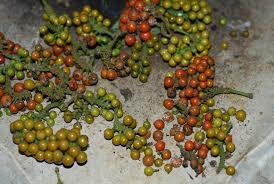 It is a close relative of cubeb pepper and a relative of black pepper and long pepper. Unlike cubeb pepper, which is large and spherical in shape, Ashanti peppers are prolate spheroids, smaller and smoother than Cubeb pepper in appearance and generally bear a reddish tinge. The stalks of Ashanti pepper berries are also distinctly curved whilst those of cubeb pepper are completely straight. The plants that provide Ashanti pepper are vines that can grow up to 20m in length, climbing up boles of trees by means of adventitious roots. These are native to topical regions of Central and Western Africa and are semi-cultivated in countries such as Nigeria where the leaves (known as uziza) are used as a flavoring for stews. Like other members of the pepper family, Ashanti peppers contain 5-8% of the chemical piperine which gives them their ‘heat’. They contain large amounts of beta-caryophyllene, which is being investigated as an anti-inflammatory agent. They also contain significant proportions (10%) of myristicin, elemicin, safrole and dillapiol. In terms of flavor, Ashanti pepper is very similar to cubeb pepper but is much less bitter and has a fresher more herbaceous flavor. Though known in Europe during the Middle Ages (it was a common spice in Rouen and Dieppe in 14th Century France), these days, its use is marginalized to West and Central Africa. It is used in West African cuisine where it imparts “heat” (piquantness) and a spicy, pungent aroma to classic West African “soups” (stews). Even in West Africa, Ashanti pepper is an expensive spice and is used sparingly. Often, a few grains are in a pestle and mortar before being added (along with black pepper) to soups or to boiled rice. The spice can also be substituted in any recipe using cubeb pepper, where Ashanti imparts a less bitter flavor. The pepper is also sometimes one of the ingredients in the Berbere spice mix used in the cuisines of Ethiopia and of Eritrea. However, West African Pepper is a highly esteemed spice in its region of origin and may be hard to get abroad; thus, long pepper is more often used in Berbere. After going through the types of Apples list, it’s on to Peppers! 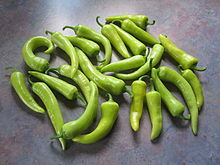 Each week I’ll feature a different type of Pepper, through Wiki and various other sites for info. Starting off with Black Pepper. Spice it up! Black pepper (Piper nigrum) is a flowering vine in the family Piperaceae, cultivated for its fruit, which is usually dried and used as a spice and seasoning. When dried, the fruit is known as a peppercorn. When fresh and fully mature, it is approximately 5 millimetres (0.20 in) in diameter, dark red, and, like all drupes, contains a single seed. Peppercorns, and the ground pepper derived from them, may be described simply as pepper, or more precisely as black pepper (cooked and dried unripe fruit), green pepper (dried unripe fruit) and white pepper (ripe fruit seeds). Black pepper is native to south India, and is extensively cultivated there and elsewhere in tropical regions. Currently Vietnam is the world’s largest producer and exporter of pepper and producing 34% of the world’s Piper nigrum crop as of 2008. 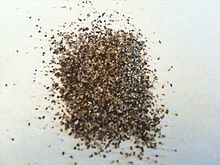 Dried ground pepper has been used since antiquity for both its flavor and as a traditional medicine. Black pepper is the world’s most traded spice. It is one of the most common spices added to European cuisine and its descendants. The spiciness of black pepper is due to the chemical piperine, not to be confused with the capsaicin that gives fleshy peppers theirs. It is ubiquitous in the modern world as a seasoning and is often paired with salt. Black pepper is produced from the still-green, unripe drupes of the pepper plant. The drupes are cooked briefly in hot water, both to clean them and to prepare them for drying. The heat ruptures cell walls in the pepper, speeding the work of browning enzymes during drying. The drupes are dried in the sun or by machine for several days, during which the pepper around the seed shrinks and darkens into a thin, wrinkled black layer. Once dried, the spice is called black peppercorn. On some estates, the berries are separated from the stem by hand and then sun-dried without the boiling process. Once the peppercorns are dried, pepper spirit and oil can be extracted from the berries by crushing them. Pepper spirit is used in many medicinal and beauty products. Pepper oil is also used as an ayurvedic massage oil and used in certain beauty and herbal treatments. “White pepper” redirects here. For the Ween album, see White Pepper. 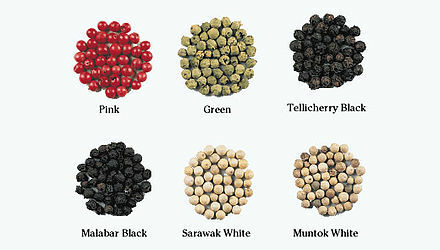 White pepper consists of the seed of the pepper plant alone, with the darker-colored skin of the pepper fruit removed. This is usually accomplished by a process known as retting, where fully ripe red pepper berries are soaked in water for about a week, during which the flesh of the pepper softens and decomposes. Rubbing then removes what remains of the fruit, and the naked seed is dried. Sometimes alternative processes are used for removing the outer pepper from the seed, including removing the outer layer through mechanical, chemical or biological methods. Ground white pepper is often used in cream sauces, Chinese and Thai cuisine, and dishes like salad, light-colored sauces and mashed potatoes, where black pepper would visibly stand out. White pepper has a slightly different flavor from black pepper, due to the lack of certain compounds present in the outer fruit layer of the drupe, but not found in the seed. A slightly sweet version of white pepper from India is sometimes called safed golmirch (Hindi), shada golmorich (Bengali), or safed golmirch. Green pepper, like black, is made from the unripe drupes. Dried green peppercorns are treated in a way that retains the green color, such as treatment with sulphur dioxide, canning or freeze-drying. Pickled peppercorns, also green, are unripe drupes preserved in brine or vinegar. Fresh, unpreserved green pepper drupes, largely unknown in the West, are used in some Asian cuisines, particularly Thai cuisine. Their flavor has been described as spicy and fresh, with a bright aroma. They decay quickly if not dried or preserved. Wild pepper grows in the Western Ghats region of India. Into the 19th century, the forests contained expansive wild pepper vines, as recorded by the Scottish physician Francis Buchanan (also a botanist and geographer) in his book A journey from Madras through the countries of Mysore, Canara and Malabar (Volume III). However, deforestation resulted in wild pepper growing in more limited forest patches from Goa to Kerala, with the wild source gradually decreasing as the quality and yield of the cultivated variety improved. No successful grafting of commercial pepper on wild pepper has been achieved to date. Orange pepper or red pepper usually consists of ripe red pepper drupes preserved in brine and vinegar. Ripe red peppercorns can also be dried using the same color-preserving techniques used to produce green pepper. Pink pepper from Piper nigrum is distinct from the more-common dried “pink peppercorns”, which are actually the fruits of a plant from a different family, the Peruvian pepper tree, Schinus molle, or its relative the Brazilian pepper tree, Schinus terebinthifolius. A pink peppercorn (French: baie rose, “pink berry”) is a dried berry of the shrub Schinus molle, commonly known as the Peruvian peppertree. As they are members of the cashew family, they may cause allergic reactions including anaphylaxis for persons with a tree nut allergy. The bark of Drimys winteri (“Canelo” or “Winter’s Bark”) is used as a substitute for pepper in cold and temperate regions of Chile and Argentina where it is easily available. In New Zealand the seeds of Kawakawa (Macropiper excelsum), a relative of black pepper, are sometimes used as pepper and the leaves of Pseudowintera colorata (mountain horopito) are another replacement for pepper. Several plants in the United States are used also as pepper substitutes, such as Lepidium campestre, Lepidium virginicum, shepherd’s purse, horseradish, and field Pennycress. Pepper is native to South Asia and Southeast Asia and has been known to Indian cooking since at least 2000 BCE. J. Innes Miller notes that while pepper was grown in southern Thailand and in Malaysia, its most important source was India, particularly the Malabar Coast, in what is now the state of Kerala Peppercorns were a much-prized trade good, often referred to as “black gold” and used as a form of commodity money. The legacy of this trade remains in some Western legal systems which recognize the term “peppercorn rent” as a form of a token payment made for something that is in fact being given. The ancient history of black pepper is often interlinked with (and confused with) that of long pepper, the dried fruit of closely related Piper longum. The Romans knew of both and often referred to either as just “piper”. In fact, it was not until the discovery of the New World and of chili peppers that the popularity of long pepper entirely declined. Chili peppers, some of which when dried are similar in shape and taste to long pepper, were easier to grow in a variety of locations more convenient to Europe. Before the 16th century, pepper was being grown in Java, Sunda, Sumatra, Madagascar, Malaysia, and everywhere in Southeast Asia. These areas traded mainly with China, or used the pepper locally. Ports in the Malabar area also served as a stop-off point for much of the trade in other spices from farther east in the Indian Ocean. 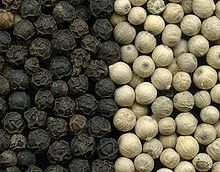 Following the British hegemony in India, virtually all of the black pepper found in Europe, the Middle East, and North Africa was traded from Malabar region. Pepper gets its spicy heat mostly from piperine derived both from the outer fruit and the seed. Black pepper contains between 4.6% and 9.7% piperine by mass, and white pepper slightly more than that. Refined piperine, by weight, is about one percent as hot as the capsaicin found in chili peppers. The outer fruit layer, left on black pepper, also contains important odor-contributing terpenes including pinene, sabinene, limonene, caryophyllene, and linalool, which give citrusy, woody, and floral notes. These scents are mostly missing in white pepper, which is stripped of the fruit layer. White pepper can gain some different odours (including musty notes) from its longer fermentation stage. The aroma of pepper is attributed to rotundone (3,4,5,6,7,8-Hexahydro-3α,8α-dimethyl-5α-(1-methylethenyl)azulene-1(2H)-one), a sesquiterpene originally discovered in the tubers of cyperus rotundus, which can be detected in concentrations of 0.4 nanograms/L in water and in wine: rotundone is also present in marjoram, oregano, rosemary, basil, thyme, and geranium, as well as in some Shiraz wines.